A full view can be created by uploading a background image and then placing hotspots (in the form of andon style lights) on the image. 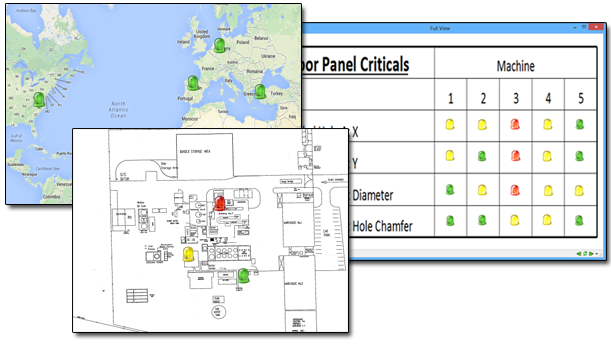 The image is typically a map of the factory or shop floor, but can be any image you choose. Hotspots are represented by any of a few styles of light. When created, you declare the data to query and any of several trend rules to check. When you data passes all trends, the light is green. When there are trends in the data, the lights begin flashing yellow or red depending on the trend that occurred. 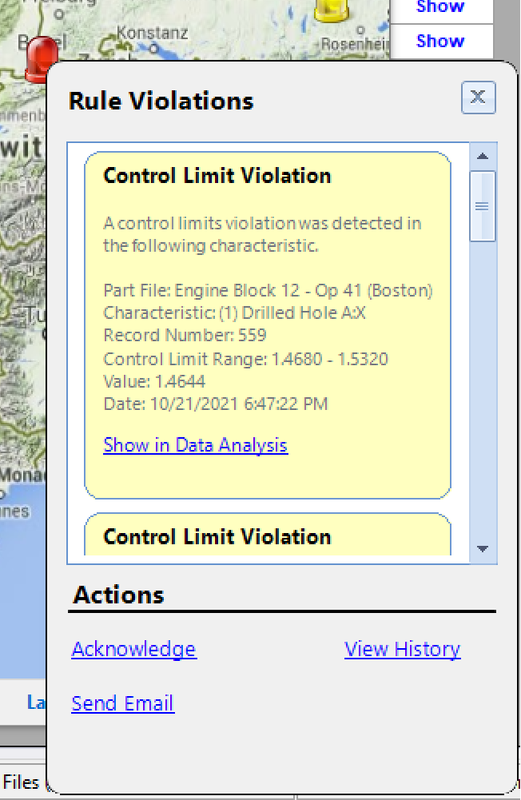 The hotspots you create can also be links to other full views. This allows you to create drill through links from one full view to another. The color of the hotspot that is linked to another full view is the worst case of all hotspots on that full view. If that full view has links to other full views, the checking cascades to capture as many levels as necessary. When an issue occurs and a light begins flashing, you can select it to perform other actions such as acknowledging the issue, running an analysis of the problem data, or emailing a colleague. Set your hotspots to sticky and they will keep flashing until you acknowledge them. Great for making sure you do not miss problems if you aren't watching full view when an exception occurs. Turn off the sticky flag and they will only flash as long as the data is showing trend exceptions. If the data improves the lights go back to green. This can help with situations where you want to display your full views on an overhead monitor and do not planning to acknowledge every exception. Double click any running full view and it will launch into its own window. This window can then scroll through all currently running full views and even be set to run a slide show on a 10 or 30 second interval.